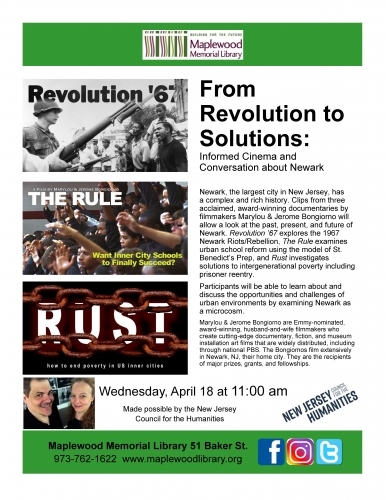 From Revolution to Solutions: Informed Cinema & Conversation about Newark Wednesday, April 18 11:00 am Main Library Newark, the largest city in New Jersey, has a complex and rich history. Clips from three acclaimed, award-winning documentaries by filmmakers Marylou & Jerome Bongiorno will allow a look at the past, present, and future of Newark. 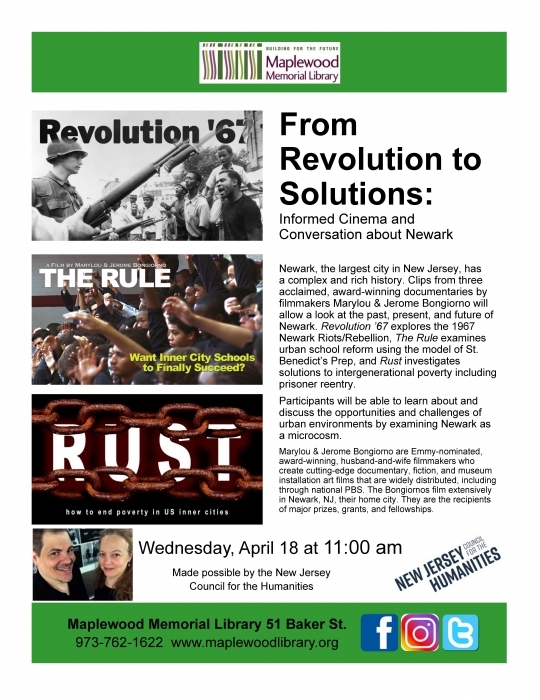 Revolution ’67 explores the 1967Newark Riots/ Rebellion, The Rule examines urban school reform using the model of St. Benedict’s Prep, and Rust investigates solutions to intergenerational poverty including prisoner reentry. Participants will be able to learn about and discuss the opportunities and challenges of urban environments by examining Newark as a microcosm. Marylou & Jerome Bongiorno are Emmy-nominated, award-winning, husband-and-wife filmmakers who create cutting-edge documentary, fiction, and museum installation art films that are widely distributed, including through national PBS. The Bongiornos film extensively in Newark, NJ, their home city. They are the recipients of major prizes, grants, and fellowships. Free & open to the public Made possible by the New Jersey Council for the Humanities.